As our seasons change and the nights draw in it’s all about cosy knits, big bowls of warming soups and family gatherings around a table full of hearty comforting feasts. 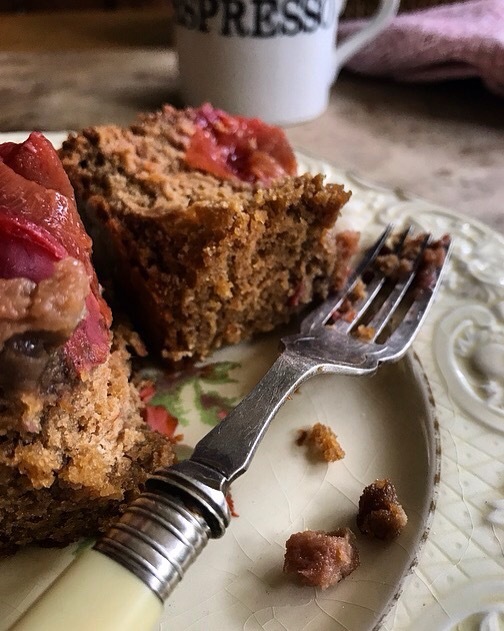 Along side come the wonderful autumnal bakes ( indulge it all gets hidden under the layers! 😉 ) to have over a chat and a pot of tea/coffee or as a dessert warm with custard. Crumbles are great, who doesn’t love a crumble or a sticky toffee pudding, but to have a simple delicious dessert ready that would work for both is a great addition to your repertoire! This one is ideal and simple to prepare. Although it’s gingery and if it’s not a spice you like then leave it out, maybe swap it for cinnamon. Although it’s a cake it could easily be called a sponge or a spongy cake! It’s handy to have ready for a dinner party or a Sunday lunch when you’re juggling everything you own and oven space is limited, it can be made the day before and kept wrapped in the fridge then bought back to room temperature before serving with custard or cream. 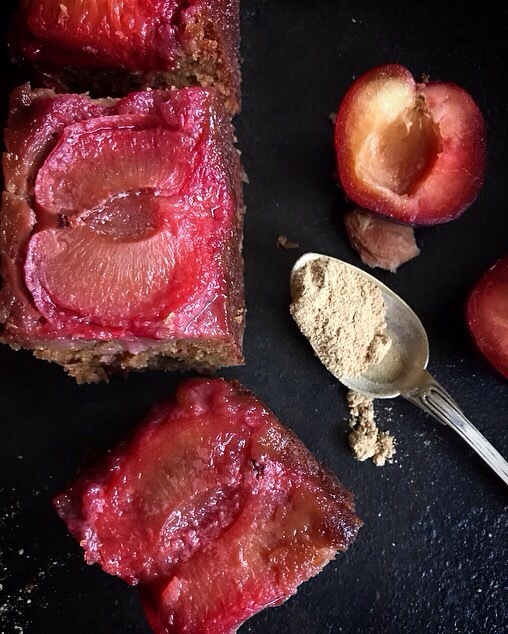 My plums were a little tart which I like but I guess you could always make sure you sprinkle extra sugar before the bake (see recipe / method below ) it works well for me because I’m not over keen on really sweet cakes! I’ve just had a piece with a coffee and it was delicious after being in the fridge since Monday! – which is what reminded me to post the recipe!! I should also add here that this is all mixed / prepared in a saucepan stirred with a spoon, not only simple but just as importantly minimum clear up!!!! It cuts into 16 squares so great for a crowd! You will need: 23cm square cake tin greased and lined with baking parchment. Butter the paper generously (sides and base) and sprinkle with demerara sugar. Heat oven to 180C/160C fan/gas 4. Prepare your tin with the baking parchment, butter and sugar then lay the plum halves cut side down on the bottom of the tin. Melt the butter, sugar and syrup in a large pan over a low heat, stirring until smooth. Set aside and cool for 10 mins, then add the eggs and milk. Sift in the flour, bicarbonate of soda and spices, then mix to a smooth batter. Pour the batter into the tin, over the plums and bake for 45-55 mins until firm to touch. Cool in the tin for 10 mins, then turn out onto a wire rack and leave to cool. 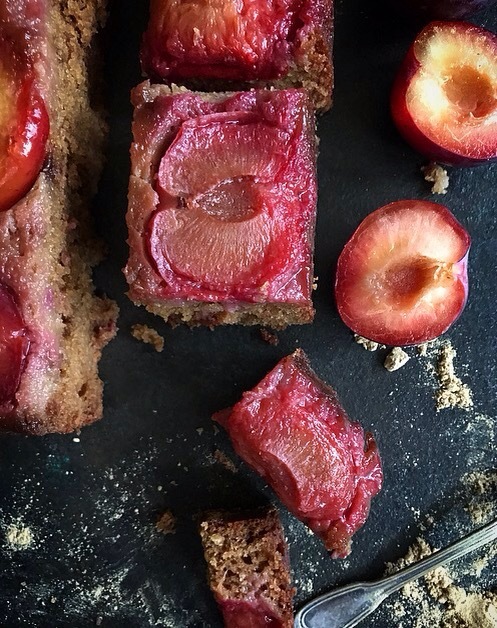 Turn it out upside down so the plums are on top. Serve whilst still warm if you wish or as I mentioned it keeps well in the fridge wrapped for upto 5 days. As always let me know if you tried it and what you thought.